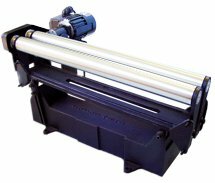 Orienting Rolls effectively orient and convey parts in a quiet and gentle non-vibratory manner. Increased spacing between parts is often achieved, lending itself to other applications where parts are inspected or gauged. Ring-Jets are simple three piece mechanical devices which induce a flow of air through a tube without obstructing the tube in any way. They can be utilized in conveying of material and parts, dust, fumes, etc., which do not respond to conventional pressure or vacuum systems.